This is great. 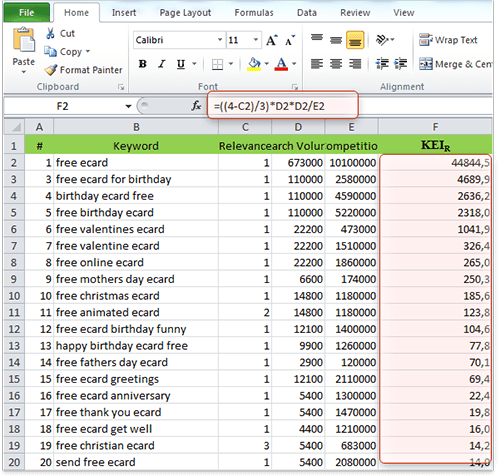 I love the Excel tip. I've never taken the time to learn about how to write formulas, but now have one. Gerben, could you make your point a bit more clear? Do you mean keyword checks in allintitle, allinanchor etc.? Renaldi, unfortunately in this case the only thing that's helpful is your common sence. 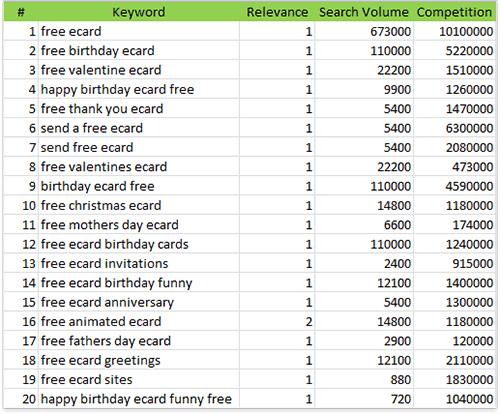 You put a grade 1-3 depending on how close you think a keyword is to your site's offer and topic. If you don't want to decide this yourself, you can just use the normal KEI formula I also provided: search volume squared, divided by competition. That's right. I guess only a human can decide which word combination closer describes what you sell. How can we measure relevance ? A 3-grade scale as you described is a rather subjective measure, depends on our personal judgement. How can we categorize that this keyword is 1, while others are 2 or 3 ? Other question, how do we modify our KEI calculation? Can't change it as i see it? But the relevance is to be generated by the user himself, right? About the competitors settings, why don't use the title, anchor and url appearences too? Or just those? it's possible that 1.000.000 right about a certain topic on the web. But if your html is correctly build, you only have to take it up to those who have good html also.